Engraving in the preface of "Practical Hydropathy"
"The practice at this Establishment embraces what is safe and desirable in that of other hydropathic establishments, and avails itself in appropriate cases of the valuable influences of electricity in its various forms, nor does it exclude the careful employment of medicines in those exceptional cases where their co-operation is found necessary to effect a cure. Whatever diseases medical science has not unequivocally demonstrated to be incurable come within the range of this method of treatment, including alike, as proper subjects, the exhausted sufferers from organic disease, and the man of business seeking no more than relaxation from toil combined with bracing influences. The internal arrangements are such as to render it admirable as a winter residence for those who might otherwise have had to leave the country. The advantages to be derived from wintering at this Establishment are too numerous for mention in a prospectus, nor could they be realised without a personal investigation. It should not, however, be necessary to do more than hint at any means which might avert to some the sentence of banishment so many have to endure each year. There is a rapidly growing perception of the fact long patent to us, that the question of housing in winter is of far greater need to an invalid than that of climate; and residence abroad, it is known, is all but invariably a sacrifice of the former to the latter. 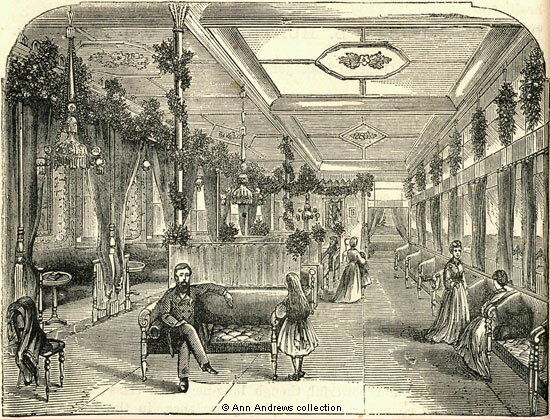 Such is the size and peculiar arrangement of this Establishment, that weeks might used indoors in the winter season without any attendant disadvantage to health; and the superior claims of the popular winter resorts in point of climate are perhaps counterbalanced by the advantages in housing and treatment by this lnstitution throughout the winter months". "After having a little breathing time, I feel myself bound by every consideration to return you and Mrs. Smedley my most sincere and heartfelt thanks for the kind interest you manifested on behalf of myself and my dear wife, at as time and in circumstances when we peculiarly needed the assistance and sympathy of friends. The old proverb says truly, 'that a friend in need is a friend indeed'. Such friends we have found in you both, when on the point of being crushed by affliction and other adverse circumstances. "The treatment under the guidance of yourself and Mrs. Smedley has been to us both like life from the dead. My dead wife, as well as myself, feel quite renewed, and we hope permanently restored to health. I waited four days before writing, to see how we would feel after coming home, and i now rejoice to tell you that we both continue strong and healthy. Now and then I feel this week a little of the old headache, but a cold sitz and cold foot bath carries it soon away. Neither of us have felt so strong and comfortable for many many months as we have felt since out return from Matlock Bank. Both of us carry on the treatment at home, as regular and as near as we can to the directions we received. "When we were both going to Matlock Bank the first time we felt very low and disheartened, having been both of us so long under the doctors' hands, and received so little benefit from them, that we were near giving up all in despair. "Now, my dear sir, whatever circumstances it may please Providence to place me in henceforth, you may rest assured that your kindness, and that of Mrs. Smedley, will never be effaced from our hearts, and we shall ever retain a most grateful recollection of your willing service to us in your hour of need. My dear wife begs to join me in sending her grateful acknowledgements to you both. Our sincere prayer is, and shall be, for the Lord to bless and reward you both most abundantly." There are many other similarly grateful comments in "Practical Hydropathy". Dr. William Bell Hunter, M.D., C.M. Glas. Univ. arrived in Matlock as John Smedley's career was drawing to a close in 1872 and was appointed as the hydro's physician. After a visit by their friend Mr. Alcock of Mansfield, who dined with the Smedleys that summer, John Smedley noted how he had been successfully cured some seven years before. He then added "Such successful cases, and we have had them by thousands - have made us regardless of our own lives, until now we have had to stop from sheer exhaustion, and give up our charge to Dr. W. B. Hunter". The Smedleys had, by this time, been caring for others for over twenty years. Dr. Hunter had previously worked as a Physician in Forres, Moray. He had been born in Glasgow in 1844. During his time at Smedley's he contributed an article on hydropathy to Encyclopædia Britannica. He was clearly popular with the patients as in 1877 a number of them presented him with a testimonial (an illuminated address, according to the local paper) to show their opinion of his great professional skill and appreciation of his kind and sympathetic nature. When he first arrived in Matlock he lived in Knowleston Place, then moved into Smedley's and eventually went to live at Hillside (later West Lea). He was only 50 years old when he died at Hillside on died 2 Dec 1894; four days afterwards a Board meeting of the Directors recorded "their deep sense of loss which the Institution had sustained. ...For 22 years he presided over the Medical Department of this Institution with conspicuous ability and marked success". The Company's annual report of 1895 stated that he had devoted his energies and talents to the advancement of hydropathy and the welfare of Smedley's in particular. Smedley, John "Smedley's Practical Hydropathy, 15th ed", James Blackwood & Co., Paternoster Row, London. By the time this edition was published Mr. Smedley had died and the business had been taken over by Smedley's Hydropathic Company (Limited). Smedley, John "Smedley's Practical Hydropathy, 15th ed", James Blackwood & Co., Paternoster Row, London. From the 1871 census for Scotland. Dr. Hunter, his wife and young daughter Edith (born 5 May 1870) were living at Edge Hill, Forres, Moray, Scotland. "Derbyshire Times", 3 February 1877. William Bell Hunter was living in Knowleston Place in the 1876 Kelly's Directory. He was not in Matlock in 1881, though was still listed in Kelly's Directory of that year and living at Smedley's. He and his wiife were shown at at Hillside (later West Lea) in Kelly's 1887 Directory, the 1891 census and Kelly's 1891 Directory. Mrs. Hunter continued to live at the property for a while after his death - see Kelly's 1895 Directory. Miss Hunter lived in Edinburgh and was there until at least 1955. His father was said to have died just before W.B.H., and had run a hydropathic establishment at Bridge of Allan. Peach, Lawrence du Garde (1954) "John Smedley of Matlock and his Hydro", Bemrose Publicity Co.: Derby & London. "Derbyshire Times", 31 August 1895.